WEST LAFAYETTE, Ind. — Indiana high school students in top-finishing teams of the third annual Purdue Research Park Entrepreneurship Academy competition received college tuition vouchers during a special event Friday (June 26). The vouchers ranged from $100 to $500 and can be used at all Purdue University and Ivy Tech Community College campuses in Indiana. About 50 juniors and seniors from 21 Indiana counties participated in the program. The weeklong academy was based on Wendy Kennedy’s entrepreneurship program “So what? who cares? why you?”. Kennedy’s program has been adapted by numerous entrepreneurship and educational organizations across North America. Students formed teams to create business plans and investor presentations for a range of case studies. First place went to “Impulse,” with team members Jim Schrader of Central Catholic Junior & Senior High School in Lafayette, Anthony Rice of Greenwood High School in Greenwood, Princessa Rennewanz of Logansport High School in Logansport, Nitesh Bajaj, West Lafayette High School in West Lafayette and John Kipfer of Adams Central High School in Bluffton. 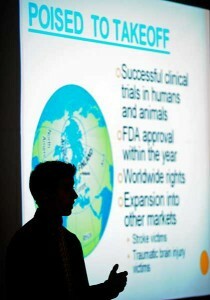 The team was mentored by Jonathon Gortat of the Purdue Research Foundation’s Office of Technology Commercialization. Rice of Greenwood High School agreed. “The whole experience left me with an understanding of how much it takes to be a successful entrepreneur,” Rice said. Rennewanz of Logansport High School was a second-year participant in the academy. “I had no idea how much technical work goes into creating a business,” added Kipfer. Purdue University faculty, Purdue Research Foundation staff, industry experts and high-tech business entrepreneurs worked with the teams to test the feasibility of the case studies, identify capital needs and devise a management plan. “It’s been a busy week, but rewarding especially when you see the light bulb go off in a student’s eyes when you answer their questions,” Gortat said. Second place: Saar Inc. with team members are David Gerth, Franklin Central High School, Indianapolis; Alexandra Huang, Greenfield Homeschool Co-op, Indianapolis; Caleb Nagel, Benton Central High School, West Lafayette; Briseida Sandoval, Frankfort High School, Frankfort; and Andrew Stearns, Argos High School, Argos. The team was mentored by Shane Fimbel of the Purdue Research Foundation’s Office of Technology Commercialization. Third place: Petroleum with team members are Greg Burns, Central Catholic High School, Lafayette; Dongyun Lee, Hamilton Southeastern High School, Fishers; Jennifer Park, Bloomington North High School, Bloomington; Aaron Simmons, Shawe Memorial High School, North Vernon; Jacob Stouder, Triton High School, Etna Green; and Shane White, Greenwood High School, Greenwood. 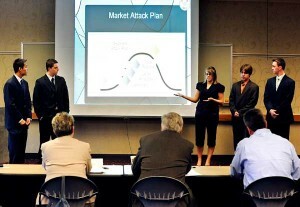 The team was mentored by Heather Clark-Reynolds of the Hoosier Heartland Small Business Development Center. Participating students were from Adams, Allen, Benton, Cass, Clinton, Delaware, Floyd, Gibson, Greene, Hamilton, Hancock, Hendricks, Howard, Jefferson, Johnson, Lake, Marion, Marshall, Monroe, Tippecanoe and Vanderburgh counties. Judges for the academy were Brad Addison, Barnes & Thornburg LLP; Jody Hamilton, Greater Lafayette Commerce; John Hertig, AMIPurdue (Alfred Mann Institute for Biomedical Development); Gail Koehler, Purdue Employees Federal Credit Union (PEFCU); and David Shelby, ICx Griffin Analytical. Academy sponsors included AMIPurdue, Barnes & Thornburg LLP, Camille’s Sidewalk Café, CSO Architects, Dairy Queen, Flowers by Rustic Bouquet, Greater Lafayette Commerce, Holladay Properties, Ice Miller, Knoy Apparel, Lafayette Office Supply, PEFCU, the Purdue Research Foundation and Sign Art Etc. RipeRight: Emily Bielefeld, Westfield High School, Westfield; Daniel Collins, Floyd Central High School, Floyds Knobs; Niall Lockyear, F.J. Reitz High School, Evansville; Caralyn Rich, Frankfort High School, Frankfort; Bosi Zhang, Hamilton Southeastern High School, Fortville. The team was mentored by Susan Davis of Greater Lafayette Small Business Development Center. BikeRight: Sadie Brown, Taylor High School, Kokomo; Franklin Eaglebarger, Indiana Academy for Science, Math & Humanities, Cedar Lake; Austin Marcotte, Brownsburg High School, Brownsburg; Vinya Sagi, West Lafayette High School, West Lafayette; Dalton Snyder, Gibson Southern High School, Haubstadt. The team was mentored by Raul Flamenco of FlamencoNets LLC. DrillRight: Cary Carreño, Frankfort High School, Frankfort; Phillip Foreman, Lake Central High School, Crown Point; George Garrett, Benton Central High School, Pine Village; Grant McAdams, Franklin Central High School, Indianapolis; and Nicolas Spoentgen, Jefferson High School, Lafayette. The team was mentored by Chris Beltran of Passageways. DiagnoseRight: Madison Donoho, Frankfort High School, Frankfort; Tiffiny Dreibelbis, Argos High School, Bourbon; Keilor Gilbert, Eastern Greene High School, Solsberry; Christopher Nei, Elmhurst High School, Fort Wayne; Carmen Siew, Crown Point High School, Crown Point; and Andrew Thomas, Leo High School, Fort Wayne. The team was mentored by Stroh Brann of Seneca Consulting LLC. TestRight: Mathew Altepeter, Jefferson High School, Lafayette; Josie Gandy, Frankfort High School, Frankfort; Si Yu Huang, Greenwood High School, Greenwood; Jake Pusateri, Hamilton Southeastern High School, Fishers; and Kyle Yoder, Franklin Central High School, Indianapolis. The team was mentored by Chris McEvoy of Actum Group. ReadRight: Emmanuel Bravo, Triton High School, Bourbon; Nicole Jancetic, Elmhurst High School, Fort Wayne; Mark Krutolis, West Lafayette High School, West Lafayette; Alex Robinson, Indiana Academy for Science, Math & Humanities, Goshen; and Tom Zhang, Hamilton Southeastern High School, Fortville. The team was mentored by Steve Thalls of ActionCOACH Business Coaching. Great to see a homeschooler represented among the winners – congrats!